If you are doing an outside show you will want to prepare for the worst. We did a load in once in a freak downpour and I was wearing canvas shoes. All my signs and table cloths got soaked, and I had wet feet the entire day. Bean, Lily and the Beantown crew just returned from a whirlwind road trip out to Portland where we attended Crafty Wonderland, a large indie craft fair at the Oregon Convention Center. The show worked out to fall perfectly within our vacation timeline and we have friends we’d been dying to visit in the Portland area so we piled into the car and took a 12 day road trip that included visits to Spiral Jetty in Utah, state parks in Idaho, Montana and Wyoming and a day in Yellowstone. It was an amazing trip and we had a blast. The craft show was a great way to make it a working vacation and earn a little money for the return trip. Crafty Wonderland was our first large indoor fair and I learned a lot. I thought I’d share some tips for first timers to either indoor or outdoor fairs. Include your company logo on a sign somewhere at your booth. Whether it’s a large banner or just a small sign, you want to give your potential customers a visual they will remember. Hang tags on all your products are another great way carry branding throughout your booth and to provide customers with valuable information about your pieces. I use our hang tags to include sizing and pricing information. I created lots of small signs with images of Bean in our products to help customers visualize the way they look in action. Most of our signs were destroyed after our last outdoor fair when it rained, so I invested in laminating everything so we could use them again and again. I did not include pricing information on the laminated signs so that if prices change (we include sales tax so when we go to different states it often does) we can still always use our signs. I brought WAY more inventory than I needed out to Portland, but when people wanted something in a different size I always had it on hand. That’s money in my pocket I wouldn’t have had otherwise and more of my product out in the world. Many people are not comfortable placing orders at shows and waiting several weeks for a product to be shipped to them. A lot of folks come to shows expecting to purchase on the spot, and will expect to have multiple sizes or colors available to them. I put one of everything out on the table and keep multiples and alternate sizes and colors in tupperware under the table skirt. My favorite part of attending indie craft fairs is checking out the amazing booth designs. I have seen people use cake plates, wooden milk crates, old suitcases, cupcake tiers, candy dishes, vintage mirrors, cigar boxes, shoe cubbies and granny rugs in some really creative (and low budget) presentations. Booth design is all about creating a cohesive look that represents your brand. Spray painting things all one color was our method of choice for tying together things we’ve built with thrift store finds. 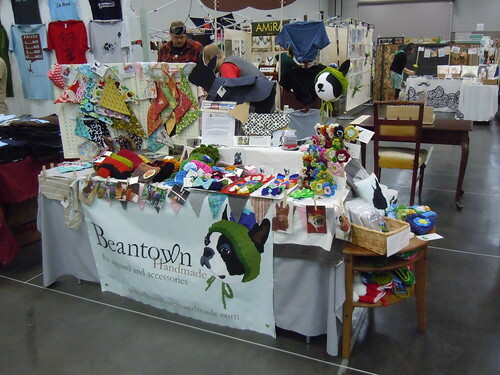 I created my own Boston Terrier mannequin to bring our hats to life and displayed it high on our table to draw attention to our booth. Height is your friend, especially if you are working with just one 6′ table. Banners, bunting and tiers will catch the eye of passers by. Not handy with power tools? Pegboard or chicken wire in vintage frames is an easy project to start with, and is a great way to display jewelry or other small items. My face always hurts from smiling too much after shows. I do make an effort to be cheerful and greet customers, but then I retreat a bit for them to look around. Think about the last time you walked into a store at a shopping mall and gauge your customer response accordingly. As someone who used to work retail at a mall I know it’s not fun for the greeter or the customer to hear a bunch of sales and gimmicks rattled off. When I’m able I don’t eat in front of customers or text. I let them know I’m there if they need me, and if I notice a lot of interest in a particular item I might answer some commonly asked questions. I love hearing about pets and if you want to show me a picture of your dog on your phone at a show, bring them on. If you have done a craft show, you know there are certain things that get asked or comment made again and again. In my case it’s usually, “oh Buster would never let me put that on him”, “squeel, so cute but Tina would eat that in a minute” or “your dog is going to kill you in your sleep”. I do tire of telling people that my dog could care less because I’ve spent hundreds of hours training him and earning his trust, but I find that putting out a photo of me photographing Bean and giving him liver snacks usually does the trick. Other common questions – what materials are used? how do I size my pet? do you do custom work? I now put out information about our fibers including a color chart, I put together a sizing diagram and custom order forms as well. Every show we attend I learn more and more and write notes while things are fresh in my head. Do you wholesale? Put out information about it. I bring packets with information for potential wholesalers. Better yet, contact shops ahead of time to let them know you’ll be in their area. There will always be things you didn’t anticipate. For example, I never thought I would need a sign that said, “please don’t put your dogs on the table”. If you are doing an outside show you will want to prepare for the worst. We did a load in once in a freak downpour and I was wearing canvas shoes. All my signs and table cloths got soaked, and I had wet feet the entire day. Aside from laminating signage, bringing cinder blocks or tent weights is a must for outdoor shows. Large sheets of plastic to line the walls of your tent are helpful just in case. You may want to bring clips or pins to raise the hem of your tablecloths off the ground in case of bad weather. Muddy, rain soaked tables don’t look so hot. Weigh down your displays with tiny sandbags or bags of beans if they aren’t already heavy. You can find tents online for $125-200. We purchased a 10′ white EZ Up tent and it has worked well for us. or a similar service online. Make sure they come with imprinter slips! You will need to get tour customer’s card number, name, exp date, and ask for their zip code to process through most online terminals. We process cards using ProPay, and they offer a discount for Etsy sellers. You will need to use a imprinter to record card information, then enter information into the computer after the show. The bummer with this method is when cards are rejected and your items are long gone. Crafty Wonderland provided sellers with card swipes that connect to your smart phone. Sellers could sign on the phone and receive their receipt via email. It was magic! You can find a variety of electronic card readers online, and if you do a lot of shows they will probably be worth the investment. I’d love for experienced craft show vendors to share any tips you might have as well. Next week I’ll post a great big craft show checklist. Don’t forget your breath mints! Looking for more art and craft show tips? Click HERE. For credit card sales I use Square; no imprinting on sales slips, no after the fact inputting of info, just swipe with a reader that inserts into your smartphone and the sale is done! And approved, right there and then. Very affordable, too. I have actually been shopping for a banner and love the one here in the article. Something else to add to my To Do List! I’ve been noticing you around the internet for a couple of years now. I’m so glad you’re doing so well! There’s just something about you that makes me feel good! Thanx for your encouragement and helpfulness. These tips are always helpful!! Especially when your new and you feel clueless. I know I did. And I still haven’t perfected the craft sale thing. Its a lot of preparation…Its a good Idea to set everything up at home to have an idea of what you may be missing.Its strange, sometimes I try not saying much to people but hello, and then they leave quickly while others like it quite, some like you to tell them more. I almost try and read people. I know I like to be left alone when I shop. I hate feeling pressured. I think if someone is going to buy something they will regardless, not just because you gave them a sales pitch. Thanks for the tips… Three day fair on Memorial Day Weekend. I have to say, I’m a little scared and excited. Thanks so much! I just did my 2nd indoor fair & would like to keep doing this & go to outdoor. How do you find out about shows? Joy I have found a lot of small local shows on my local Kijiji, they have listings if you look at Community->Events->Craft Shows, hope that helps! A great way to find out about shows is ask other crafters. If you are participating in a craft show ask fellow crafters for recommendations, they are happy to share this info. Some even have a hand out list of shows they will be in. If a customer asks if you make so & so, don’t go home & start making them. The reason this so & so can’t be found is because it’s been made by someone in the past & is not a big seller. I only start making something new when alot of customers start asking for it & then only about 10 – 20 to start with. I compare my booth with a B&M store. Would I want to walk into a store where there are only a few item of anything for sale or if there are so many different items I wouldn’t know where to look 1st, I think not! Dona- I get asked if I make different things a lot. If I get a chance I try to see what other vendors have and then I can direct the asker to where they might find it. Another thing I’ll do is point out that I only make what I make so it’ll be the best I can possibly make. Wonderful information full good advise for experienced and the novice. excellent info. I love indoor craft sales. Thank you for the great advice and tips! I hope to be part of a fair in November this year. Its going to be my first, so your tips are going to be very handy and useful for me. Great information! I just got a Square and am waiting to try it out. I’m hoping to be doing some outdoor Flea MArkets in the next month so this post came just in time! I was looking into credit card apps for my iphone.. A great way to accept credit cards is with your phone and there are several apps that send you a free swiper and you can even e-mail customers their receipt.. Thinking about Square or Pay Anywhere!! I recently blogged about my first year of craft fairs. I have tried really hard with my display, trying to get it looking interesting and enticing to potential customers. thanks so much for all the great comments! A great way to find out about shows is to subscribe to ZAPP events, you can apply for shows through their website as well. Thank you thank you! I just found your blog and I somehow I think discovered Square Up from it too! I’ve been wanting to get a credit card processing for my craft shows! Thanks for sending out a link to this article. A lot of detailed, specific information – which is very refreshing – will bookmark! We plan to start scoping out craft fairs soon to get a handle on what seems to work, get ideas and see if customers actually buy – or just browse. What an adorable booth! I love the dog water bowls at the outdoor show, what a clever way to attract your perfect customers. Great article. This article is helpful; I’ll forward it to the members of one of my Etsy teams! Another thing I take along is my iPad, which is queued up with MailChimp so people can add their names to our mailing list. Thanks for the photos and creative ideas! Great personal touch to this post! Here’s a link to a site that ranks art fairs and provides a forum also. It could be helpful. Great article! As a fellow pet vendor I know what you about dogs on the table. We have a small camp table that we place just outside our booths that we call the changing table. It works great and people chuckle when they see the name. Thanks so much for the article–very encouraging. We’ll be doing our first craft shows soon. I think that your point that you’ll always be learning more as you go is particularly helpful to remember…makes it a lot less intimidating. For all us crafters, it really is a different kind of way to use our creativity! Another ‘Danielle’ above commented that it’s a good idea to set it all up at home first to get a good idea of what you’ll need–I couldn’t agree more! Thank you for the great tips. I use to do a lot of craft shows but not to many anymore. And I’m never done a show outside, always to worried what the weather will do. Lining your tent with plastic is a great idea, don’t think I would of thought of that. Thank you for sharing your great article. very helpful article! thanks so much. my cheap “first-up” tent cracked a few weeks ago on a very windy day in st. pete, fl. the market has $20 tent rentals available- nice, sturdy white pop-up tents. they will even set it up before i get there in the morning. definitely invest in a good tent if you are going to buy one, or inquire if your market has rentals available. great for traveling to a show or just freeing up more room for inventory in your car. some even rent tables and chairs. just thought i would pass along the info…. thanks! Great Article. I was going to do a craft fair last fall, but got sick. My friend did it for me, along with her jewelry. I make handmade greeting cards, and handmade envelopes. We did sell a few things, but I wanted to be there to see how it went. I am planning to do the same fair this year. It’s in a high school gym, so we don’t have to worry about the weather in November. I was wondering if you could share where you had your banner printed and how much it cost? I’m about to do my first craft booth at a gallery in mid-November and you’re advice about ProPay was great! I looked on several Etsy threads and all of the sellers who don’t have smart phones use this method too. Thanks! Lots of great advice Anne! Your display and banner are excellent! As someone who has done shows and fairs, indoors and outdoors, small and large, for 9 yrs, the best thing I can add is just be confident….in yourself and your product!! That confidence will carry through to your customers and they will feel confident purchasing from you! Great advice, thank you! I have a show in 2 weeks. I use the square & it makes things so easy for me & for the customer! After my shows (I only do 1-2 a year) because I sell online & doing both would be a lot of time spent sewing. I would love that but I have a family & a job outside of the home. I wrote a blog post recently. I also organize a craft show at my church every december. So I share tips from the eye of the organizer. I’m just about to start doing shows this summer! I’m excited but admittedly a little nervous! Thank You for these totally real-life tips! I never would have thought about lifting the table cloth to keep it clean… well until I had to wash it to get all the mud off! Best place I’ve found to get banners that are digital on vinyl (allows you to upload your own image) is bannersonthecheap.com. Check them out. I’ve used them for years.